The John Montran Descendants Project is a personal project to explore the possibility that my great-grandfather, John Montran married twice. Once to Ida May Barber and once to Maude Minnie Winter. I believe he had one daughter with Ida (my grandmother) and two daughters with Maude. It is my goal to either confirm or disprove that the two John F. Montrans were the same individual. I believe that Ruth Grace Montran is my grandmother’s (Madonna Mae Montran) (unknown) half-sister and that they shared the same father, John F. Montran. I am continuing this project by following the lives of Ruth’s two daughters. Dorothy Bell Cologne was the first child of John Terrell and Ruth Grace (Montran) Cologne. She was born on 13 January 1924 in Pennsylvania (Probably Philadelphia). In 1930 she was living with her parents at 2 Farragut Street in Philadelphia and she was attending school. 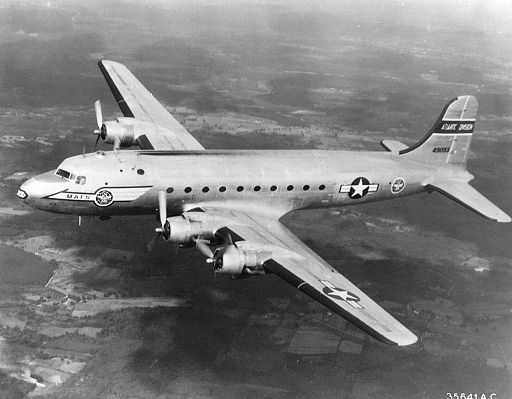 C-54 – Plane type Dorothy flew back to the United States in. In 1940 she was a lodger at Fred J. Harley’s home in Springfield, Delaware County, Pennsylvania. She was attending school. She was an excellent singer and sang in several school plays. Sometime between 1940 and 1946 she moved to Florida. In 1946, she reentered the country flying on a military plane. She had been out of the country as a singer. Her stage name was Jennifer Marshall. Her home is listed as 515 – 5th St., No St. Petersburg, Fla. In November 1967, Dorothy married Charles J. D’Aprix. They remained married for almost nine years and divorced on 2 September 1976. It does not appear that they had any children. During her adulthood, Dorothy worked as a Real Estate Agent for Keller Williams and other agencies in the Miami area. She often sang with various groups and choirs. She died on January 29, 2017, in Miami, Florida. Internment is unknown. If you are a descendant of any of the above individuals, I would love to hear from you. Please use the contact form in the side panel or the comments form below. Ancestry.com. 1930 United States Federal Census [database on-line]. Provo, UT, USA: Ancestry.com Operations Inc, 2002. Original data: United States of America, Bureau of the Census. Fieenth Census of the United States, 1930. Washington, D.C.: National Archives and Records Administration, 1930. T626, 2,667 rolls. Morning Call, The, (Allentown, Pennsylvania) 1994-06-01, Main Edition, Page 21 – John J. Cologne Jr. (Newspapers.com). “California, San Francisco Airplane Arrival Card Index, 1936-1949,” database with images, FamilySearch (https://familysearch.org/ark:/61903/1:1:Q29Z-1514 : 17 March 2018), Dorothy Belle Or Jennifer Cologne Or Marshall, 1946; citing Immigration, NARA microfilm publication A3361. (Washington, D.C.: National Archives and Records Administration, 1998), FHL microfilm 100,682,131. “Florida Marriage Index, 1822-1875 and 1927-2001,” database, FamilySearch (https://familysearch.org/ark:/61903/1:1:VJ8T-M3T : 28 November 2014), Dorothy B Cologne, Nov 1967; from “Florida, Marriage Collection, 1822-1875 and 1927-2001,” database and images, Ancestry (http://www.ancestry.com : 2006); citing Florida Department of Health, Jacksonville, Florida; and Jordan Dodd, Liahona Research. “Florida Marriage Index, 1822-1875 and 1927-2001,” database, FamilySearch (https://familysearch.org/ark:/61903/1:1:VJ8T-KTQ : 28 November 2014), Charles J Daprix, Nov 1967; from “Florida, Marriage Collection, 1822-1875 and 1927-2001,” database and images, Ancestry (http://www.ancestry.com : 2006); citing Florida Department of Health, Jacksonville, Florida; and Jordan Dodd, Liahona Research. Homelight.com, Dorothy D’aprix – Real Estate Agent at Keller Williams Realty Premier. https://www.homelight.com/agents/dorothy-d-aprix-fl-00119314. Tributes.com, Dorothy D’Aprix (1924-2017) – No Image. http://www.tributes.com/obituary/print_selections/104435613. “United States Public Records, 1970-2009,” database, FamilySearch (https://familysearch.org/ark:/61903/1:1:QJ5S-3W5M : 16 May 2014), Dorothy D’Aprix, Residence, Davie, Florida, United States; a third party aggregator of publicly available information. “United States Public Records, 1970-2009,” database, FamilySearch (https://familysearch.org/ark:/61903/1:1:QJHV-JQCS : 23 May 2014), Dorothy Daprix, Residence, Miami, Florida, United States; a third party aggregator of publicly available information.